Tateyama Snow Wall (立山雪の大谷) is one of the most popular tourism in Toyama. There is a huge snow walls appear from the middle of April to June. The highest point of the snow wall will be some times over 20m high. This walk is about 500m long. This is located on Murodo Highland of Tateyama Mountains. The altitude is over 2400m from the sea level. Therefore, snow remains almost nearly to the summer. There are parking and restroom at Tateyama Station. The admission for round trip is 4310 Yen for adult, and 2160 Yen for Kids. Season: From the middle of April to the middle of June. During Golden Week, there are extra buses and cable cars. 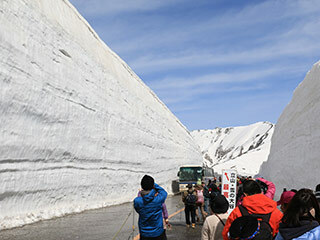 Tateyama Snow Wall is one of the most famous Japanese tourist spots in the world. It is a part of Tateyama Kurobe Alpine Route located in Tateyama, Toyama Prefecture. At the Murodo Highland, there is a huge snow wall walk appears from the end of Spring to the beginning of Summer. The height of the wall sometimes reaches to 20m tall. This snow wall is about 500m long. It has a breathtaking view of snow. Tateyama is the heavy snowfall region in the world. This highland is 2450m high from the sea level. So, even in summer, the weather is very cold and snow stays long time. Note: You must have nice walking shoes and warm outfit for cold weather.